It has been awhile since we last posted. Summer 2013 had us sailing right up until mid-October. The boat was hauled on November 4th after a summer where we logged 1180NM on Lake Ontario. We were aboard from April 27th to October 13th. The longest we have ever lived aboard. But, with the weather getting cooler, we moved on land for the winter into a condo in downtown Kinston, where we could at least see the water. It was a late spring here this year and so moving aboard was delayed. We had to have a thru hull replaced as a valve was cracked and so it took a few weeks for the weather to warm up enough that the boat yard could do the repair. On May 9th, the boat was launched and on May10th we moved aboard. Of course, May also brought many other changes. After two years, we have decided to leave Kingston and return to PEI. This had led to almost two months of getting the boat ready, winding up job responsibilities, getting our PEI house ready for summer rentals, moving out of our winter accommodations, moving our stuff back to PEI and moving onto the boat, which we will need to sail back to PEI this summer. After returning from a two week trip to PEI spent scrubbing and painting to get our home ready for summer guests, we were more than ready to throw off the dock lines and get out on the water. With our home rented all summer, there is no rush to get the boat back to PEI and we have until early September to make our way East. And as we are both now self employed again, as long as we can get internet access on a regular basis, we can, and do, work from the boat. We knew we had to replace and tape the cotter pins in the rigging, clean the boat from top to bottom, provision and perform several other basic maintenance tasks. Two days, we thought, and we can be happily out on the water. No fixed address for the summer. Our NEXUS cards and passports in hand so we can explore the US side before heading East. 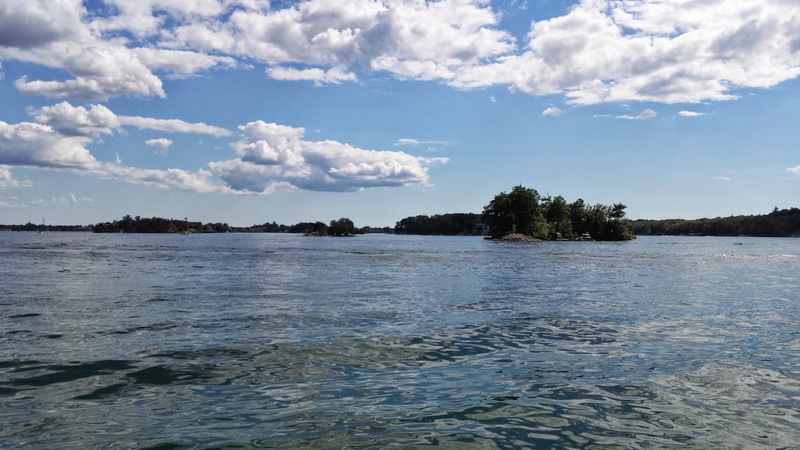 Lazily exploring Lake Ontario, the Thousand Islands and the St. Lawrence. Taking our time to visit places we didn't have time to see before and revisiting favourite anchorages we will not likely be back to anytime soon. Of course, nothing ever goes completely smoothly and our anticipated two days at dock stretched to four as we dealt with a few unexpected issues. When we went to refill the propane tanks we realized that one needed replacing as it had expired. No problem a run to the local the marine store couldn't fix we thought. How hard can it be to find a 10lb tank. Apparently, not all 10lb tanks are created equal. The fibreglass tank we first bought was a half inch too large to fit in its intended locker. So an internet search and a half a dozen phone calls later, we now have a replacement on order whose specifications indicate it will fit. We will see next week when it arrives. For $200, I certainly hope so! While cleaning the BBQ, Jay realized that the diffusion plate was broken. That too is now on order. Luckily, Marine Outfitters can order it in for us and we can get that next week too. So no BBQ but at least we have the stove and oven. Then, when we took our dinghy, Ducky, out of winter storage and started to blow it up, we noticed a one and a half inch hole some little critter had chewed in it over the winter. A patch, lots of glue and 24 hours later, we were able to pump it up and now, five days later, it still seems to be holding. Hooray! So although we moved on the boat on May 10th, with trips back to PEI, shopping trips to get ready and other responsibilities, we didn't get to actually go sailing until June 21st. But, our first sail this year was a beauty! It felt wonderful to finally leave the dock. The annoyances of the past few days melted away. It was a beautiful afternoon with about 12 knots of wind and we took a leisurely sail under jib alone on a broad reach to our anchorage. Engine time=15 minutes. Sail=3 hours. We couldn't have asked for a better start to our summer.